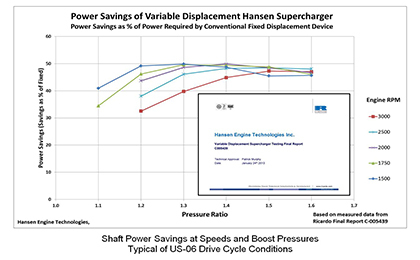 Hansen Engine has created and patented a continuously variable positive-displacement supercharger. This system supplies pressured air required to meet driver demands of an engine very efficiently during both high and low torque operation. This unique capability provides fuel economy improvements which are achieved by employing a “downsized” engine of three or four cylinders, thereby offering a competitive alternative to six or eight cylinder engines. It is also designed to challenge current industry reliance upon turbochargers. 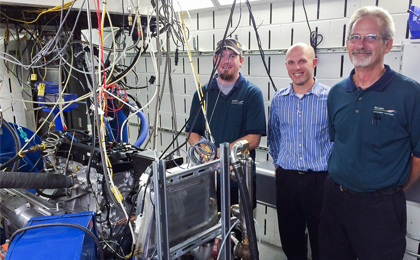 testing at the Ricardo labs in Detroit. Engines require exact amounts of airflow that change depending upon their load. Our supercharger’s unique continuously variable displacement technology provides precisely the right amount of air flow to meet a driver's power requirments with minimal system losses. Conventional superchargers are limited to providing full displacement air flow. This means that in order to match varying air mass flow to engine demand, the air flow must either be restricted or wastefully dumped to the atmosphere after being compressed. Either of these processes introduce fuel-consuming inefficiencies. 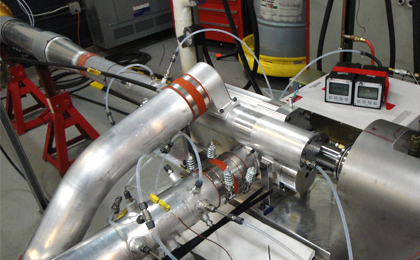 The Hansen Supercharger® reduces the work required by the engine to provide the needed air mass at the proper pressure, which results in improved overall fuel economy.